What was the FHSA scheme? The Federal Government’s First Home Saver Accounts scheme was introduced in 2008 with the aim to help Australians to buy their first home. Under the scheme, the government would make a contribution worth 17% of the first $6,000 deposited each year, giving a tax-free gift of up to $1,020 per year on-top of the interest from the bank. Interest earned was taxed at just 15% for balances up to $90,000. The catch? FHSA savings could only be used towards buying a first home, or adding to a super account if it wasn’t used to buy a property. The government abolished the scheme in the 2014-15 Budget and all tax concessions and usage restrictions will be withdrawn at the end of the June 2015. The good news? The savings can now be used for anything (not just a first property or super). The bad? You’ll no longer have a government-subsidised savings account earning a superb interest rate. Where can you put your savings now? Leaving the money in the bank is the safest option. However interest rates have been declining steadily over the last few years and the best rate currently available is a fraction of what you would have been earning under the FHSA scheme. Assuming you could earn 3.5% bank interest on top of the government’s 17% contribution and you’re in the 32.5% tax bracket, your effective interest rate plummets from 13.8% to 2.4%. That’s a 83% less interest after tax! If you’ve saved up a 20% deposit for a property, this could be a good time to activate the plan to buy your first home now that the benefits of the FHSA have ended. However you may be disappointed to discover that the extra interest you’ve earned hasn’t taken you too much closer to that dream home. 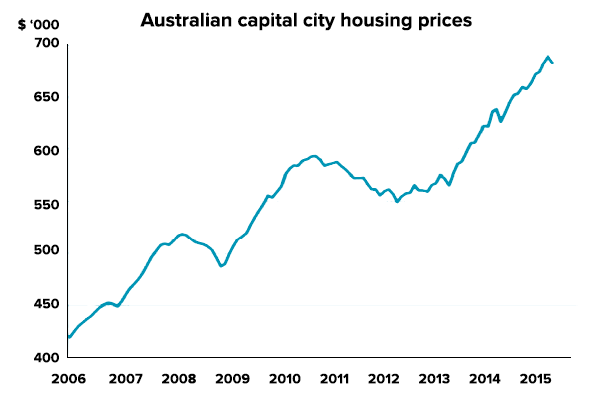 Australian property prices have risen 24% in the past 3 years. Sydney house prices have jumped even faster, up 31.4% since the start of 2012. With the country’s house price to income ratio approaching an all time high, buying a property is as difficult and expensive as it’s ever been for Australians. Something else to consider is that buying may not always be the best option. Our analysis found that renters can be better off than property owners. In addition, leverage and poor diversification make home ownership much riskier than many people expect. Another way to maximise your savings is to make a contribution to your super and take advantage of the Federal Government co-contribution scheme if you earn less than $49,488 a year (for the 2014/2015 year)1. Under the scheme, the government will make a tax-free contribution to your super when you make a non-concessional (after-tax) contribution to your super account. As only 1 in 5 Australians are self-sufficient in retirement, the additional top up to your super account will help improve your nest egg when you retire. However, the drawback of this option is that you’re unable to touch this money for many years. Investing in a portfolio of exchange traded funds (ETFs) can be a good savings strategy that provides the opportunity for higher long-term returns, as well as enjoying the benefits of low-fees and broad diversification to reduce risk. A diversified portfolio has historically achieved a return of about 8% p.a. over the long-term. However as with any investment, ETFs do have market risk. On the plus side, ETFs are highly liquid which means that they trade every weekday on the Australian Securities Exchange (ASX) so it’s easy to sell them in the future if you decide you want the money for something else (like buying a home). When investing in ETFs, one option is to select the funds yourself and trade and buy them through a stockbroker. To get the best results, you should assess the different ETFs in the market and work out the best mix of ETFs to meet your goals and risk profile. Keep in mind that you will pay brokerage every time you trade which could impact the returns you earn. Alternatively, you could use a service like Stockspot to help build and manage a diversified ETF portfolio on your behalf. We offer professional advice and portfolio management to take the hassles out of investing. Our service is fully online and we match you to an investment strategy based on your personal situation and goals. Your investment strategy is constantly reviewed and monitored by us so you don’t need to do anything. Our team is also monitoring the ETF market to select the best ETFs and the right mix of them for you. Since brokerage is included, you’re able to invest as often as you like without extra costs.